I’ve recently taken on a project of learning more about the runes, a divination system with roots in Norse culture. I spend two weeks with a rune, reading about it and letting it speak for itself. The rune I’m studying right now is Isa or Ice. I chose this rune for the wintery season when lakes around me are frozen and I have ample opportunity to study actual ice. The rune poems (ancient verses about each of the runes) describe ice as immeasurably slippery. Some books say this rune tells us to be still as ice. Others talk about how ice can form a bridge when lakes freeze, making it possible to travel to new places, but only if we watch out for how easy it is to slip. A few days into the Mercury retrograde period that began on January 21 I realized Isa is a good guide for Mercury retrograde. Mercury rules our thoughts, and with Mercury now in Fixed Air Aquarius, the theme of thought habits becomes even more salient. Thoughts can be like ice, fixed and hard. They can also be immeasurably slippery. During Mercury retrograde it is easy to slip in communication, send the wrong email, trip up on the words we meant to say, or lose track of details we need to track. At any time, but especially now, we can benefit from letting our minds become still as ice. Ice reminds me to be patient when Mercury snafus occur. Retrograde periods bring unique opportunities to bridge insights and inspirations. New possibilities emerge out of left field. Ice is simply water in another state. Hidden within the crystalline structure is the more common form of water we are used to: fluid, dissolving, buoyant. These two qualities of water are very much a part of the astrological forecast for the next two weeks: periods of fluctuation, sometimes hard and slippery and at other times, fluid and dissolving. We are navigating the slippery bridge of fixed thought (Aquarius and Mercury retrograde) while sometimes slipping into the vast lake of feelings (Venus, Mars, Neptune and Chiron in Pisces). Stillness is a good option when this back and forth seems overwhelming. The skills we are acquiring during the challenges of this retrograde period are the gifts of Ice: new roads, quieter minds, and a chance to redo past slip-ups. The Aquarius lunar cycle* reaches an expansive moment of illumination when the Full Moon in Leo opposes the Aquarius Sun on February 3. Through abstraction and vision, Aquarius gravitates towards change. The Moon in Leo adds a personal touch of passion to visionary mental constructs. Each of us needs to feel as though we matter to the future. Systems that forget to acknowledge individual and diverse creative sparks will lose sustainability. What is missing from your revolution? Sunday, February 1. Nesting urges that began yesterday apply today too. The Cancer Moon triggers the Uranus/Pluto square early this morning, perhaps making for a restless night of sleep. Agitation around safety concerns could be the reason. Cancer helps us to know what is really important to us, what we would defend at all costs, what ensures our survival. These things are important, yet we might be caught in needless anxiety over them. Relief comes through watery transits. The Moon trines Mars in Pisces; perhaps a good cry helps release worries. Don’t be afraid of your emotions today. Venus conjoins Neptune, both in Pisces. This emotional resonance is a counter balance to the Aquarian mental focus of the lunar cycle. Where do you find balance and connection? Monday, February 2. Imbolc. Some Pagans celebrate the cross-quarter sabbath of Imbolc (or Candlemas) on February 2. There is a connection to Groundhog’s Day here, too. This turning point of the year in the Fixed sign of Aquarius represents a time to forecast the future. The question, What will the weather bring in the next six weeks? coincides with the Imbolc practice of setting intention into the seeds of the growing year. Thoughts are on the future and the ways our actions in the present can create the future we envision. The Sun is bolstered in this intention with a favorable aspect to Uranus in Aries. It really is a day to infuse our dreams with visionary energy. The Moon in fire sign Leo makes a favorable connection to Saturn in another fire sign, Sagittarius. We are encouraged to put sustaining structure under our dreams. Tomorrow’s Full Moon begins to be felt late tonight (CST) when the Leo Moon opposes retrograde Mercury in Aquarius. We are encouraged to think outside the box. Try a new strategy. 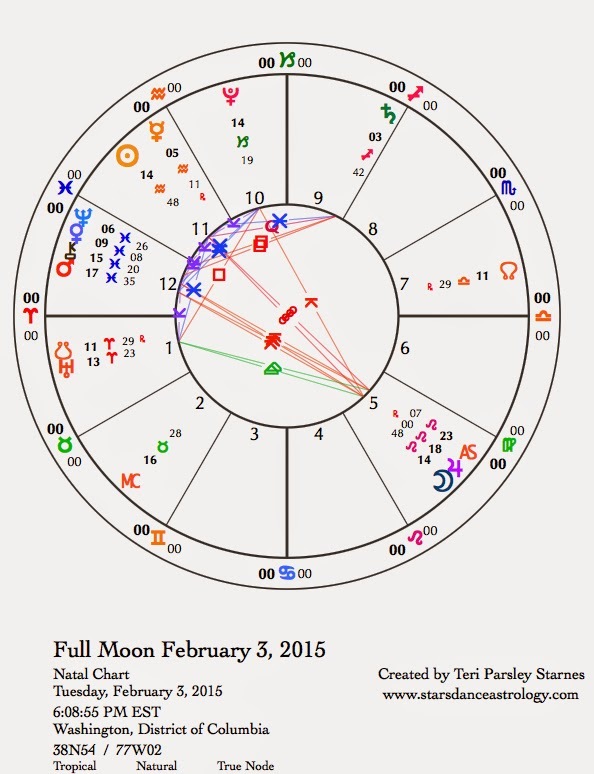 February 3—Full Moon: Illuminating. Astronomical Imbolc. This year, the Leo Full Moon happens on the same day as “astronomical Imbolc,” when the Sun reaches the mid-point of Aquarius. (See yesterday’s forecast for information about Imbolc.) The mid-point of a Fixed sign is a powerful point of focus. All Fixed signs have a purpose of stewarding the resources of the season and the element associated with that sign. For Aquarius, it is the element of air in the season of visioning. Mid-winter is a good time to begin looking at seed catalogs and planning actual and metaphorical gardens. Coupling the intensity of this mid-point with the higher energy of a Full Moon gives special importance to this day. Every Full Moon is an opportunity to integrate opposite signs. The mid-winter sign of Aquarius is opposed by the mid-summer sign of Leo. The spark and light of summer holds an important illumination for us right now. Aquarius and Leo are creative signs. Aquarius uses the gifts of mind to fuel creativity. Leo uses the gifts of fire. For Leo, fire means the spark that feeds our egos and our passions. We long for significance and to contribute our personal talents to the benefit of others. Aquarius takes that focus on the community and asks us to imagine greater freedoms and authenticity for each individual within the collective. Leo gives Aquarius passion; Aquarius gives Leo a bit more dispassion. The balance point is discerning where we matter as individuals and where the whole is more important than the parts. The chart for the Full Moon shows a Yod (cf. Hebrew, Hand of God) aspect pattern. This pattern emphasizes a sense of destiny and unique genius. The apex of the Yod, in this case the Moon and Jupiter in Leo, are receiving the gifts of this destiny and the unique challenges that come along with them. Perhaps you’ve been missing a bit of Leo flair. In our efforts to be team players, we may be longing to stand out and be noticed for our specialness. Egotism can get in the way, but a diminished sense of self doesn’t help either. The opportunity here is to boost creativity to energize collective vision. All Yods have points that challenge this integration. For this Yod, the particular challenge comes from the disparate desires of Leo and Pisces. There is a temptation to think that desires for recognition are bad or that idealism is unrealistic. Avoid the tendency to value martyrdom over self-aggrandizement. A combination of these values is the best course. The illumination of this phase of the lunar cycle may be greatest when we embrace our inconsistencies. Neither pure logic nor pure fantasy is the answer. With Mercury moving backwards, we have the opportunity to reset our deepest patterns and reenergize our visions. Wednesday, February 4. Mars in Pisces forms a quincunx aspect to Jupiter in Leo. Adjustments need to be made. Yesterday, I wrote about the blending of Pisces and Leo. Although these two signs seem to be at odds with each other, the combination of selflessness with creativity can be very fertile. We are inspired by random acts of brilliance. Be open to creative inspiration, infuse your deep felt sympathies with wild joy; approach the world’s pain with the spirit of a child. Let hope live alongside sorrow. Thursday, February 5. Focus becomes the focus. If you’ve let some details slide or have been having trouble with the slipperiness of Mercury moving retrograde the last two weeks, you might feel a little uncomfortable today. The Moon in Virgo will try its best to influence our organizational skills. We’ll have a tendency to drift off, lose focus, and then jerk back into the present moment with a strong sense of self-criticism. The real magic act will be to flow gracefully between the desire to be more competent and the need to let the details go. If you can help it, don’t put a lot of pressure on yourself today. Being present and open may go further than being on top of it all. Friday, February 6. Two oppositions today could offer us the turning points we’ve been looking for, especially if we focus on integration rather than exclusion. The Sun in Aquarius opposes Jupiter in Leo. We are feeling philosophical. What is the truth being revealed to you? This is an opportunity to fill ourselves with life force, expanding or contracting if need be, to show up right-sized in the world. We are not alone in the work of creating the world we envision. Who are your allies? The Moon in Virgo opposes Mars in Pisces. The Sun/Jupiter aspect today could encourage grandiose actions but the Moon and Mars are inviting us to find the value in small, determined steps toward wholeness. Bring earth to heaven and heaven back to earth. February 7—Disseminating Moon: Sharing. The Moon enters Libra today. Libra’s scales help us to weigh the experience of this lunar cycle thus far. What are you noticing about your thought habits? Has slippery Mercury retrograding through Aquarius tripped you up in any way? Have you crossed new bridges of insight? A major focus for me this lunar cycle has been to pay attention to the integration between mind and heart. This is the moment in the lunar cycle when we share the gifts of whatever we’ve been working on. With the Moon in Libra we turn to the significance of our relationships. Sharing is not a one-way street; how do we ensure balance and fairness? Are we as willing to receive as we are to give? Can we ask for what we need? Assess these qualities in your life because they influence a greater whole. Imbalance in relationship affects our dreams and visions (the Aquarius theme of this cycle). There are no difficult aspects today. Minds are supported, foundations are supported, and even our emotional depths are supported. Sharing the struggles, we are not alone even though winter can be an isolating season. Sharing the visions, we need each other. Sharing the joys, we delight in each other.